Beef noodle soup is a Chinese noodle soup made of stewed beef, beef broth, vegetables and Chinese noodles. It exists in various forms throughout East Asia and Southeast Asia. It was created by the Hui people (a Chinese Muslim ethnic group) during the Tang Dynasty of China. Left: A bowl of beef noodle soup. In the West, this food may be served in a small portion as a soup. In China, a large bowl of it is often taken as a whole meal with or without any side dish. In Taiwan, vendors that sell beef noodle may also have optional, often cold side dishes, such as braised dried tofu, seaweed, or pork intestine. Beef noodles is often served with suan cai (Chinese sauerkraut) on top, green onion, and sometimes other vegetables in the soup as well. 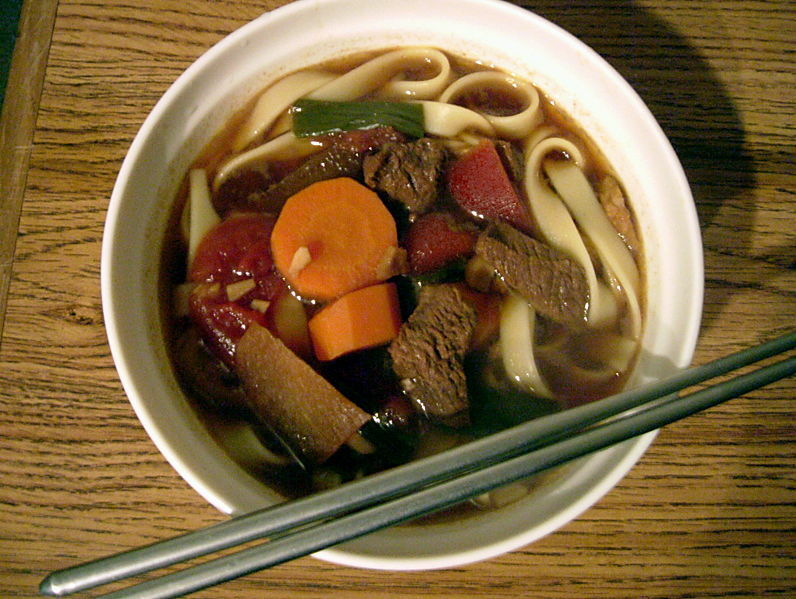 Beef noodle is often served as fast food in China.